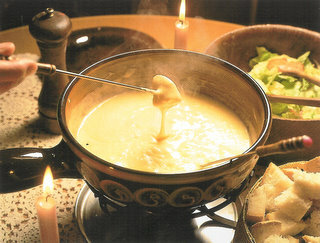 To many non-Swiss, fondue is a bit of a Seventies cliché. In Switzerland, it’s just an uncomplicated, convivial, warming winter dish – just right for this week when the temperature has been struggling to get its head above zero. There are no hard and fast rules about which cheese to use – at least none that are universally agreed upon in this most directly democratic of countries. It all depends on the region – in canton Fribourg the classic mixture (moitié-moitié, half-and-half) is Gruyère and Emmentaler; in the Jura you might get a fondue featuring some locally made semi-hard cheeses like Mont Soleil or Erguel and Tête de Moine. In central Switzerland around Lake Lucerne there’ll certainly be a bit of Sbrinz in the mix, while over in eastern Switzerland, Appenzeller and Tilsiter will likely share the honours. The white wine and the lemon juice are there for a reason – not only do they season the mixture, their acidity also helps to prevent curdling. (Young cheeses, btw, are more likely to separate than older, aged ones – make sure your cheeses are, if not mature, at least not in the first flush of youth – certainly no younger than 8 months.) It’s also important to keep stirring the fondue not only during the heating but also during the eating – first with a large wooden fork and stirring in a figure of eight, and – at table – using bread-speared fondue forks. And what to drink with fondue? White wine seems logical, since it enters into the composition of the dish, but some people (notably those to the north of the Rostigraben) consider that cool white wine can turn the cheese into chewing gum inside you, and that warm black or peppermint tea is preferable. A shot of Kirsch or other Schnapps, said to aid digestion, is also frequently offered. As for the pan, this must be a wide, shallow, earthenware caquelon, not one of those metal fondue bourguignonne pans. And when you’re done, and the last crumbs of croute/réligieuse have been prised off the bottom of the caquelon, fill it with cold water and let it soak a few hours or overnight. That way any stray bits of cheese will come away without much opposition. Interesting, first time I have seen lemon juice used, I must give it a try – A Swiss friend of mine also puts crumbled dried porcini in his mix, its great & crumbled dried toms work as well. But most of the time I just stay classic. I’ve read where truffles are being incorporated…Can’t wait to try that.